Through the Eyes of Children "Camera Kids"
The Imbabazi Orphanage was home to over 120 children, many of whom's families were killed during the 1994 Rwandan Genocide Against The Tutsi, which they often refer to as "the war." Others died of disease when they fled the Congo as refugees. The orphanage was originally founded in 1994 on Rosamond Carr's farm, Mugongo, in the hills of Mutura, near the Congo border. Due to continual outbreaks of violence, the orphanage moved to the small town of Gisenyi. In late 2005, the orphanage moved back to Mugongo into a permanent facility. Translated, Imbabazi means "A Mother's Love," and is one of the few homes where children are being raised without ethnic distinction. I was born outside of Gisenyi, in a very rural area. My family was in the middle--not ruch, but not poor either. I went to primary school before the war and worked to help my family while going to school. Then during the war, I fled with my family to Goma in July. When we returned home from Goma in September, there was nothing left, so we were very poor. Ten of us went to the Congo but only six of us returned. When we did, I was unable to continue my studies in primary school. While I was waiting to see how I could continue my studies, another war began. It was during this second war that my hands were cut off during an ambush. After that, several people rescued me and took me to the hospital where I stayed for one year. During that time, everything changed. I was then sent to an orphanage that closed after most of the children were returned to their families. I then returned home. There life was very difficult, so I decided to return to Gisenyi to see if I could find someone to help me. It was then that I was brought to the Imbabazi Orphanage. At the first orphanage, they did everything for me. They fed me, washed me, washed my clothes--but when I came to Imbabazi, I started to do these things for myself. It was here that I decided I wanted to be an artist. I found that when I learned how to feed myself, I could also use a pencil. One day, I drew something, and Mrs. Carr saw what I had drawn. She was so surprised and impressed that she gave me a notebook to draw in. From then on, I decided I wanted to be an artist. 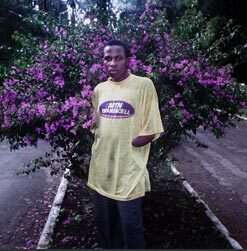 With the help of Charlene and Bobby Jendry, Frederic went to Columbus, Ohio in 2002 for six weeks where a doctor made him a prosthetic for his hands. He has since returned and has been able to support himself. He has a bicycle taxi, teaches English, and organized a Volleyball team of handicapped boys. I was born in 1987 in a medium family--not very rich, not very poor. The war started when I was 7 years old and we fled to the Congo with the whole of my family--three sisters, my mom, my dad, and me. We spent abut two months there, and after our parents' deaths we returned home alone--my sisters and I. My parents died of disease. They were not killed. When we reached home we spent a few days with our neighbors, and in December 1994 we went to the Imbabazi orphanage. In the orphanage, I started my primary school. When I was in third grade, the war started again and we had to leave the orphanage, which was in the hills of Mutura and moved with it to Gisenyi. Even here in town we've changed houses three times, not for security reasons, but to look for a better place for all of us. I'm enjoying being at this orphanage because I've met other children who have the same problems. 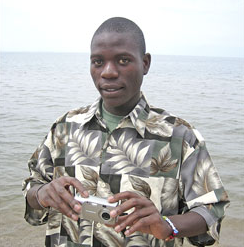 In 2006, Bakunzi began his third year in Secondary School in Gisenyi. He is the Captain of the Imbabazi Soccer team and is very popular. Bingwa Uwituze arrived at the Imbabazi on February 23rd of 1996 at age 7. He was the orphaned son of friends of Sembagare who were shot and killed at Kamira. He arrived smiling and sweet and was immediately popular with all the other children. He began his secondary education in January 2006 at Bigogwe. Good at sports, he is still one of the most popular boys at the orphanage. Devota arrived on March 18th, 1998, at age 10. Her father is dead and her mother is alive but unable to take care of her. Devota is our best drummer and is very tall and graceful. At age 11, she was only in the second grade of primary school, but she continued at school and in 2005 was in the 6th grade. Devota unfortunately failed the national exams and therefore was not eligible for secondary school. Presently we are searching for a technical school for her. Bihonda Dominique arrived at the Imbabazi on May 6th, 1998 at age 7. He was brought to the orphanage by Roberto Mauri of Doctors Without Borders. He told him that he saw both of his parents killed with machetes at Byumba. He left Byumba alone in a taxi and arrived in Ruhengeri where soldiers picked him up. Seeing Roberto Mauri's MSF car, they asked him to take him to Gisenyi, and then to me. Poor little boy--for nearly six moths he never smiled. Now he is a good student and is at the Kanzenze Secondary School. Dusabimana Jean Bosco arrived at the Imbabazi on July 13, 1996 at age 11 with his 8-year-old sister, Claudine Uwingabire. He is a brilliant student and has been either first or second in his class every trimester. In July of 2001, he passed the national exams for secondary school and was sent to the College Inyemeramitugo, where he was second in his class every trimester. For his 4th year he was sent to a school called ETAG to learn machinery and mechanics. He has an older brother who never went to school and lives with Sembagare, the Imbabazi Co-Director. His name is Kikingi. I was born in 1985 in Mutura Province. The war started when I was in the 1st grade. We all fled to the Congo with the whole of my family - I mean my 5 sisters and I, and both my parents - but my father had 2 wives, my mom and another one. We spent only about a week in the Congo and after my dad's death we returned home with my mom. When we reached home a few days later, even my mom passed away. After that, one of my dad's brothers took me and my sister to the Imbabazi orphanage and the rest of my sisters stayed home, but one of them, the youngest, passed away a few months later. All of my sisters got married, and one has 4 kids while another has 2. In the orphanage I continued my studies to the 2nd grade and then moved from the hills of Mutura to Gisenyi Town because of the security. During that second war I lost another sister. When we reached Gisenyi, I continued my primary studies up to the 4th grade. Here in Gisenyi we have moved to 3 different buildings. I didn't continue my studies because it was too hard to afford --- and I don't know how to explain it. Now my sister is in the 3rd grade and we are all happy to be here. My name is Elizabeth. I was born in the small town of Gisenyi. I became orphaned when I was a little baby, so I didn't know who my real mother was, and I've passed my whole life in different orphanages. I knew my father but didn't have a chance to stay with him because he was unable to take care of me. After my mother's death I was brought to the orphanage of a lady called Mrs. Christine. I stayed in that orphanage until the 1994 war and then we all fled to Goma in the Congo. After a few months we went to another place called Keshero, also in the Congo. Many months had passed and the authority of the orphanage decided to return me to Rwanda. In Rwanda I continued to stay in an orphanage with other children who had been separated from their families. Many of the children found theirs, but for me and other children, we didn't have families, so they sent us to different orphanages. I was brought to the Imbabazi Orphanage where I started primary school. In 1997 we were forced to leave Mugongo, the place where the Imbabazi Orphanage was founded, because of violence. We then came to stay in Gisenyi town. I am happy to be in the Imbabazi Orphanage with other kids with whom we share everything; good or bad, the past and the present and perhaps the future. I cannot close without saying thank you to all who care about us, especially the one who is both our mother and father and our everything. Gadi was brought to us by the Red Cross with his sister, Uwamahoro. His parents were lost in the Congo. Since his arrival he has been stuck with a number of illnesses. In November, 1996, he had chicken pox and in Feb 1998 he had malaria. He does exceptionally well in school and places in the top of his class. In December 1999, he was 3rd in his class with an average of 98%. In 2006 Gadi began his 3rd year of secondary school at St. Andrew’s in Kigali where he is doing very well. He is an especially talented linguist. He speaks fluent English as well as French and his own language, Kinyarwandan. Now called Bizimana John, he arrived at the Imabazi on January 3rd, 1995 at age 4. His grandmother had died, leaving him with no one to care for him. He is one of our dearest boys and very good at school. Gasaza started Secondary School in January 2006 at Kamzanze, Mutura. Gasore was new to the photography workshop in 2000. He broke his arm very badly about two years ago, and it took a long time to heal. His friend, Gadi, took this photo of him, and Gasore worked very hard to take beautiful pictures of Gadi. Gadi also took a fun photo of Gasore washing his face at the outdoor spicket. I was delighted that Gasore could join the workshop this year. Gasore has finished primary school but has not had a chance to pass the national examination for secondary school. He has begun his studies in carpentry. My name is Imanizabayo. I was born in 1987 in the small town of Gisenyi. In 1994, when I was seven years old, many things changed in our country and in my life because of the war and the genocide. Both my parents passed away during that war. I fled alone to the Congo where I entered an orphanage founded by a lady called Mrs. Christine. When we were about to return to our country, the orphanage was destroyed. I was taken by the Red Cross organization which brought me to the Imbabazi Orphanage. At that time I had found my big brother, Musabyimana Sammy, who stayed together with me in the orphanage until now. I was in the first grade of primary school when I entered the Imbabazi Orphanage. After reaching the orphanage we didn't have the chance to stay in one place because of the violence. In 1997, we left the place where the orphanage was founded in Mugongo and we came to stay in Gisenyi town. Even here we've changed places about three times to seek a comfortable place. I can not finish without telling thank you to all who contribute or have contributed in supporting our orphanage, especially our "God Mother" Mrs. Rosamond Carr, who had a good thought of founding this orphanage. We are what we are now because of her. In 2006, Imanizabayo Leon is in his 5th year of Secondary School and doing very well. I was born in 1988 in Gisenyi Province, the district of Nyamyumba. My family was in the medium ones, not rich, not poor. The war started when I was six and I fled to the Congo with my mother. The rest of my family - I mean my two brothers and my dad - didn't leave home. After some days in the Congo, we returned back home. We spent about two weeks there and then moved to Mutura just to visit my family's friends - it was my mom, my brothers and I. When we reached Mutura, we stayed. We didn't come back to Nyamyumba for reasons I don't know because I was too young. There from Mutura, my mom used to go back home to visit my dad. After a long time, about 1 year, my mom passed away from disease. After our mother's death we were brought to the Imbabazi orphanage. In the orphanage our father came to visit us, but after a few months of that, he passed away too. We didn't know what he died of. I started my primary school in the orphanage, and when I was in the 2nd grade, even in Mutura, the security became bad, and we moved from there to Gisenyi Town. We changed houses about 3 times here in Gisenyi just to find a comfortable place for us. In the orphanage I've met many other children and we share the same experience of life. Now I'm in the 5th grade. My brother, John Bosco, is now in the 1st year of secondary school and another brother of mine, Kigingi, is working at Sembagare's house. We are all okay in this orphanage but sometimes I have bad thoughts which are hard to explain. I cannot finish without saying "thanks" to all who contribute to support us especially to those who had a good thought of creating this orphanage, and the first one is Mrs. Rosamond Carr. 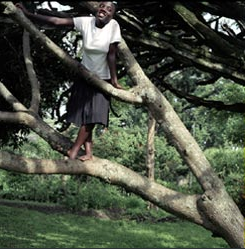 Claudia Ingabire is studying at the Essa Secondary School for Girls in Ruhengeri. In 2006 she began her 3rd year there. The Red Cross brought Jacqueline to me in 1996 from the Congo. When I first laid eyes on her at the age of four, the only thing she was certain of was her name. She had been in an orphanage since birth so there is very little factual information about her background. She is an excellent student in school and very well liked by the other children. 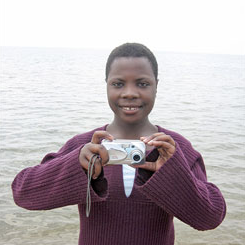 In 2006, Jacqueline’s greatest interest continues to be photography. In January 2006, Jacqueline had the highest marks of all the children at the Imbabazi Orphanage on her exams for entry into Secondary School. She is now at the Group Scholaire For Girls at Nyundo, Gisenyi. Mukabera Beatrice came to us with her younger sister, Nyrababazi (5), and her brother, Ngirabakunzi (8), on December 28th, 1994. She was 6. Their parents had died. She soon became our best dancer, and in 2006 she starred in and directed the girl’s dance group. She is a very good student and was first in her class in secondary school in Gisenyi. She is greatly loved at Imbabazi. Musa arrived at the orphanage in January 1997 at the age of six, along with two other boys. They were brought to us by The Red Cross with no information about their backgrounds except that both of Musa's parents died in Goma during the refugee crisis. Musa is an incredibly bright but shy kid. He does very well in school, but was often intimidated by some of the bigger kids. 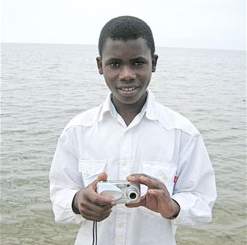 On one occasion early into the workshops, street kids took his disposable camera. Musa worked very quietly and diligently during the photography project and produced some of my favorite images. Please look at each of the photos in his portfolio as well as the portrait he took of his friend, Twagira, hanging on the volleyball net (see Twagira’s Bio). This is a kid that you want to see protected because he is so bright and has a lot to offer. In 2006, Musa started his third year at secondary school. He nearly always places 2nd or 3rd in his class. He is also a very good guitarist, a soccer player, and according to Roz Carr, a “dear boy”. 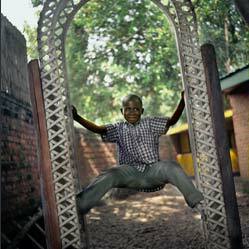 Twagira came to the Imbabazi Orphanage in Oct. 1996, we think at the age of 6. His aunt brought him to us with his little brother, Twahirwa, age two, because their mother had died the week before. There was no father. In 2006, Twagiramungu finishes the 2nd year of secondary school, in a rural area of Rwanda, near Ruhengeri. He has grown very tall and likes to play soccer as always. He is very smart at school and is always one of the top five students in his class. 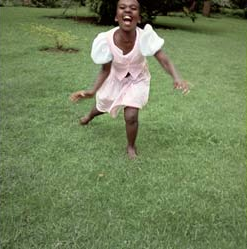 Umuhoza arrived at the Imbabazi Orphanage at the age of seven in September, 1996. Her parents were never located. Although she was old enough to remember her parents she claims she does not remember them. She is one of the best dancers among the children. In 2006, Umuhoza finishes the second year of secondary school. She still likes to dance and listen to music. She is always in a happy mood and that is why everybody likes to be around her. I was born in 1987, but not here in Gisenyi. I don't know where I was born because it was at the time all the trouble started. I didn't know much about my family because when the war started I was very young. But what I do remember is that I was happy with my family. When the time came to leave my home, I didn't go with my parents. My brother Gadi and I fled with our neighbors. On the road we even lost our neighbors, so we continued along with strangers. After one day alone, we met a nice woman who took us with her two children, and we continued with her until we reached the Congo. In the Congo the woman took us to an orphanage of Catholic sisters. Later we were transferred to another orphanage in Ruhengeri and we spent one year there. They then transferred us in this orphanage, Imbabazi, in 1996. The orphanage was in Mutura, and that is where I started my primary school. When I was in the 3rd grade, the war started again and we came here to Gisenyi Town. Even when we reached Gisenyi, we've moved to many houses. The life in the orphanage is okay. When it is time to be happy, we are happy, and if it is time to be sad, we are sad. I cannot finish this without telling you our worries. Sometimes we think about what could become of us if the orphanage closed or stopped working, because we've heard of other orphanages, which did so. I would like to thank all who support our orphanage and the ones who founded it, especially our lovely "God Mother" Ms. Rosamond Carr. In 2006, Uwamahoro finishes her 4th year of secondary school. She is always very quiet and loves listening to music and reading books.